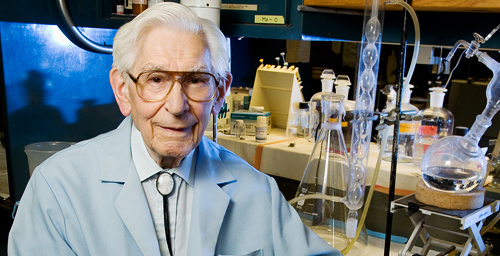 Fred Kummerow, a 98-year-old emeritus professor of comparative biosciences at the University of Illinois, explains the primary causes of heart disease. His research contradicts commonly held notions about the role of dietary cholesterol. CHAMPAIGN, lll. - A 98-year-old researcher argues that, contrary to decades of clinical assumptions and advice to patients, dietary cholesterol is good for your heart - unless that cholesterol is unnaturally oxidized (by frying foods in reused oil, eating lots of polyunsaturated fats or smoking). The researcher, Fred Kummerow, an emeritus professor of comparative biosciences at the University of Illinois, has spent more than six decades studying the dietary factors that contribute to heart disease. In a new paper in the American Journal of Cardiovascular Disease, he reviews the research on lipid metabolism and heart disease with a focus on the consumption of oxidized cholesterol - in his view a primary contributor to heart disease. Many of Kummerow's insights come from his relentless focus on the physical and biochemical changes that occur in the arteries of people with heart disease. For example, he has worked with surgeons to retrieve and examine the arteries of people suffering from heart disease, and has compared his findings with those obtained in animal experiments. He and his colleagues first reported in 2001 that the arteries of people who had had bypass operations contained elevated levels of sphingomyelin (SFING-oh-my-uh-lin), one of several phospholipids (phosphate-containing lipids) that make up the membranes of all cells. The bypass patients also had significantly more oxidized cholesterols (oxysterols) in their plasma and tissues than people who had not been diagnosed with heart disease. Human cells incubated with the blood plasma of the cardiac patients also picked up significantly more calcium from the culture medium than cells incubated in the plasma of healthy patients. When the researchers added oxysterols to the healthy plasma, the proportion of sphingomyelin in the cells increased, as did the uptake of calcium. Earlier research, including studies conducted by medical pioneer Michael DeBakey, noted that the most problematic plaques in patients with heart disease occurred at the branch-points of the arteries of the heart. Kummerow followed up on these reports by looking at the phospholipid content of the arterial walls in pigs and humans. He found (and reported in 1994) that the branch points of the arteries in humans and in swine also had significantly more sphingomyelin than other regions of the same arteries. For Kummerow, the increase in sphingomyelin was a prime suspect in the blocked and calcified arteries of the cardiac patients. He had already found that the arteries of the newborn human placenta contained only about 10 percent sphingomyelin and 50 percent phosphatidylcholine (FOSS-fuh-tih-dul-COH-lean), another important phospholipid component of cell membranes. "But when we looked at the arteries of people who had had bypass operations, we found up to 40 percent sphingomyelin and about 27 percent phosphatidylcholine," Kummerow said. "It took us many more years to discover that when you added large amounts of oxysterols to the cells, then the phosphatidylcholine changed to sphingomyelin." Further evidence supported sphingomyelin's starring role in atherosclerosis. When Kummerow and his colleagues compared the blocked and unblocked arteries of patients needing second bypass operations, they found that the arteries with blockages contained twice as much sphingomyelin as the unblocked arteries. The calcium content of the blocked arteries (6,345 parts per million) was also much higher than that of the unblocked arteries (182 ppm). Other studies had demonstrated a link between increases in sphingomyelin and the deposit of calcium in the coronary arteries. The mechanism by which this occurred was unclear, however. Kummerow's team searched the literature and found a 1967 study that showed that in the presence of certain salts (in the blood, for example), lipids like sphingomyelin develop a negative charge. This explains the attraction of the positively charged calcium to the arterial wall when high amounts of sphingomyelin are present, Kummerow said. "So there was a negative charge on the wall of this artery, and it attracted calcium from the blood until it calcified the whole artery," he said. Oxidized fats contribute to heart disease (and sudden death from heart attacks) in an additional way, Kummerow said. He and his collaborators found that when the low-density lipoprotein (LDL, the so-called "bad cholesterol") is oxidized, it increases the synthesis of a blood-clotting agent, called thromboxane, in the platelets. If someone eats a diet rich in oxysterols and trans fats and also smokes, he or she is endangering the heart in three distinct ways, Kummerow said. The oxysterols enhance calcification of the arteries and promote the synthesis of a clotting agent. And the trans fats and cigarette smoke interfere with the production of a compound, prostacyclin, which normally keeps the blood fluid. "And that causes 600,000 deaths in this country each year," Kummerow said. Kummerow is the author of "Cholesterol Won't Kill You, But Trans Fats Could."